Bali, Indonesia: Home to warm air, amazing food, and the cultural powerhouse of Janet DeNeefe; a Melbourne-born chef, writer, and world-class mover. 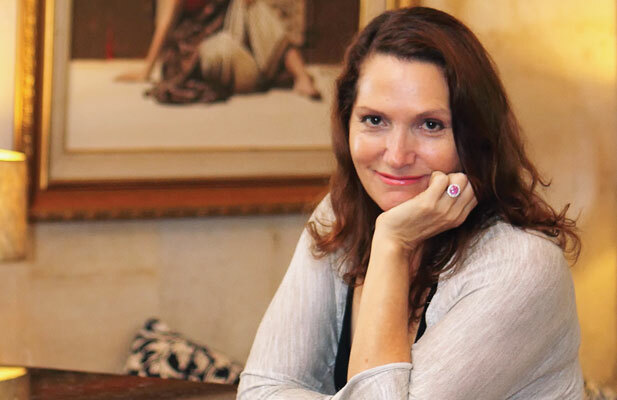 Janet DeNeefe first encountered Bali when she was fifteen and, returning in 1984, fell further under its spell when she met her husband and decided to stay for good. Since then she has opened multiple successful restaurants, including two of the hottest spots on-island. Nowadays, the mother of four also wears the feather of “Published Author” in her cap. There is much to love about beautiful Bali, but what captured DeNeefe’s heart was its rich culinary culture. In opening her restaurants, she’s not only shared it’s food with others, but also the history and technique in her edifying lessons on Balinese traditional cooking. Through the years, she has collected Balinese recipes and stories from both her husband’s family and locals who inhabit the greater area. She shares them also, through her lessons—and in recent years, books. DeNeefe was already looking to publish her first book by 2002, paving her path into the publishing world. However, after the Bali bombings, DeNeefe helped found the annual Ubud Writers and Readers Festival (UWRF), which began as a way for the community to heal, as well as share their culture with writers and readers internationally, and thereby forging her unique journey into literary history. DeNeefe published her memoir, Fragrant Rice, in 2004—without an agent. Email after email to publishers, no agent for go-between, she inevitably piqued interest. With absolutely no publishing background, she formulated a proposal that focused on her strengths, unique perspective, and perhaps most importantly, that she could sell. “I had the venues [and the clout] to sell my book. I knew someone was going to pick it up at some point.” Eventually connections with Random House and Harper Collins came through, both of which pressed her to turn her Balinese cookbook into a proper memoir. It was Harper Collins that convinced her and made it happen. DeNeefe stresses repeatedly that publishing her first book “was about serendipity as much as it was about connections.” But it was also the fact that she had a unique story, good timing, and had made the opportunities to sell her book. Pitching her idea to publishers, says DeNeefe, “It’s basically selling yourself, and telling publishers who will buy your book and how do it.” This is often less than an agent does. Although, not a difficult feat when you have “a unique and exotic story” – another criterion she stressed as necessary to catching the attention of publishers. Publishing her first book also served to push her farther into the literary world she was already one foot into with the Writers Festival. Publishing it as a memoir brought it from a technical book into the literary arena and garnered more rapport, but her aim wasn’t just to become a writer or an author, but to teach and inspire. In 2011, DeNeefe published (by Hatchette Group) her second book, Bali: The Food of My Island Home – again without an agent. She says that her books have done well in Australia and New Zealand, where they are published, but if she were to garner a more international audience, a North American publisher would be the way she would go. In North America, though, the more structured (and overwhelmed, DeNeefe adds) system seems to require an agent. In the meantime, DeNeefe, while not planning on another book, is enjoying success with both Fragrant Rice, recently translated into French, and Bali: The Food of My Island Home. Currently she is busy with the upcoming Ubud Food Festival, taking place May 27-29, 2016, and is looking forward to the next Writers and Readers Festival scheduled October 26-30, 2016; themed Tat Tvam Asi or ‘I am you, you are me.’ Her cook book be found at local bookstores and her Bali restaurants, Casa Luna and Indus.